The Versys is as much an ADV bike as a Harley Sportster is a track bike... ....its 100% a sport touring bike..the tires and suspension tell the story. Anyone who has ever ridden a true adventure bike knows what Im talking about...there is no comparison between the 2 when the road ends. I have rode a true adventure bike off road mostly gravel and some two track and the V1 would be a poor excuse for one .. Thought I'd post some details about the rumours coming out of Japan, namely that the 2019 V1K will be a part of the 4 new bikes unveiled by Kawasaki at the forthcoming EICMA show. 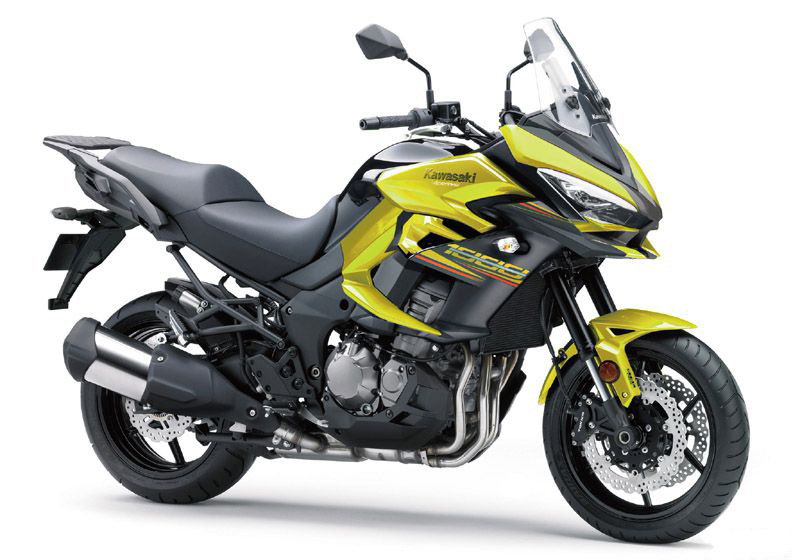 Take the photo below with a pinch of salt (artists impression and all that..) but the 2019 V1K is rumoured to be sporting updates to the electric suspension and the addition of the Bosch 6-axis IMU (inertial sensor) with cornering ABS (presumably KIBS), as per the 2019 Z1000SX. If we see electronic suspension and multi-axis ABS I predict there will be a significant price hike. With changes like those I will be stunned if they do not upgrade the infamous windscreen and at least the slope of the seat. If we see A,B,C,D,E,F I predict there will be a significant price hike. That is the rub. And the majority will not really make any difference to the bike and how it behaves in real life. Might help in the Starbucks willy waving stakes. I would consider a new one but not in that colour. Though if I got maxton to build me a shock and also one off their fork kits and fit it myself, I could probably live without the cruise control and keep what I've got. Also what does the letters say on the lower fairing panel ?